It is neither an exaggeration nor a cheap fat joke to say that of all the larger-than-life personalities to grace film, Orson Welles may have been the biggest. It’s easy to imagine him being comfortable wearing a velvet cape in a casual setting. The quintessential renaissance man, Welles counted magic—of the sleight-of-hand, bunny-from-hat variety—among his gifts, and his grandly theatrical persona was deeply rooted in the magician’s epic showmanship and knack for seduction. 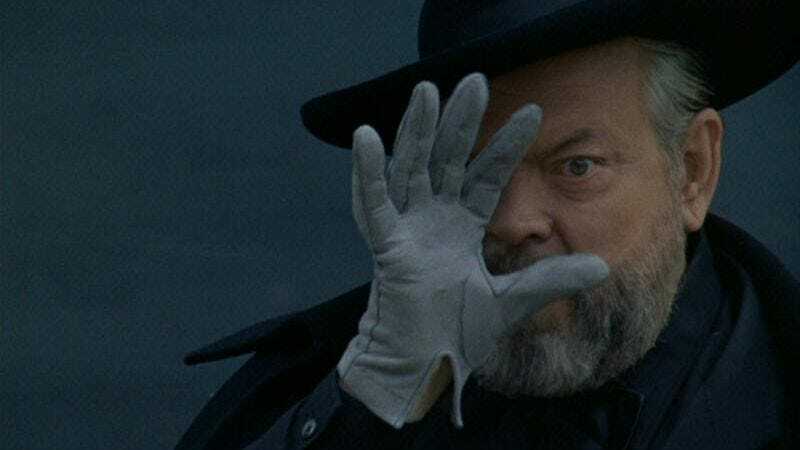 Welles’ late-period lark F For Fake is a vehicle for his exquisitely honed personality, a meditation on the nature of trickery, and an epic case of cinematic sleight-of-hand. Welles’ reality-warping cinematic essay uses the story of a series of famous frauds and hoaxes to explore the slippery line separating reality and deception, most notably in the cases of art forger Elmyr de Hory; Clifford Irving, the dashing fraud who became infamous for forging Howard Hughes’ autobiography; and Welles’ own radio adaptation of H.G. Wells’ The War Of The Worlds, a notorious pop-culture sensation that caused hysteria when it was mistaken for a news report. F For Fake delights in the sensual pleasures of storytelling—never has a man’s love affair with the sound of his own voice yielded such exquisite creative fruit as Welles’—and in its potential for deception and manipulation. F For Fake alternately suggests an elaborate act of misdirection, with Welles choreographing every intricate gesture, and a funhouse mirror where every angle reflects Welles himself. He earned his fame with an epic quasi-hoax, and late in his career, he pulled off one last great trick for an audience happy to be kicked around by such a distinguished old ham. Availability: Criterion released F For Fake on DVD in 2005, and included it among the selected titles available for Hulu subscribers.